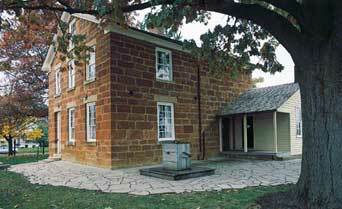 Visiting the Nauvoo, Illinois area this week, I took a tour of Carthage Jail on Tuesday. Many thanks to Sister B. for accommodating my arrival after hours (new winter hours close the site at 4:00 p.m.). I did not get to see the film, but my friend and I were treated to an unhurried, private tour of the jail led by a veteran missionary (this is Sister B.’s sixth mission for the Mormon Church!). Here are a few things I learned from Sister B. and an elder who stuck his head into the dungeon cell for a few minutes during our tour. The construction of the jail was begun in 1838, just about the time the Saints were being run out of Missouri, and completed in 1841. They built the jail just so they could kill the Prophet Joseph and Hyrum. Joseph was jailed on a false charge of treason. In bypassing the Governor and calling out the militia (the Nauvoo Legion) he was only doing what all the other towns had done. The other towns’ officials didn’t get in any trouble; only Joseph got arrested. Joseph Smith did not destroy the Nauvoo Expositor newspaper, he only ordered it done. Besides, someone else in the area had had his press destroyed five times and nobody did anything about it. Only Joseph ever got in trouble for these things. Sister B. did not know the Prophet had 33 wives but, she said, lots of people had three or four wives and nobody thought anything of it. Yet when Joseph did it everybody got upset. One thing Sister B. was absolutely sure of: The Prophet did not marry other men’s wives. It just didn’t happen. No way. A prophet would not do such things. Joseph Smith did have a gun in the jail (she admitted), but he didn’t plan to shoot anybody and he didn’t shoot anybody. In fact, Sister B. has a gun at home, but she isn’t planning to shoot anyone, either. The jailer could see just by looking at Joseph that the Prophet was no ordinary man. Sister B. explained that John 8:12 says, “He that followeth me shall not walk in darkness, but shall have the light of Christ” [sic]. Joseph Smith glowed with that light; the jailer could see it, so he treated Joseph differently, with tender care. I’ve toured Carthage Jail many times, yet every time I go I learn something new. It’s a shame that much of what I learn is rooted in pure emotion rather than in historical fact. This entry was posted in Joseph Smith, Mormon Culture and tagged Carthage Jail, Joseph Smith, Martyrdom. Bookmark the permalink. You don’t believe it’s there because you don’t believe in preexistence. To me this world is for us to explore and we have received a physical body to do this with. What we did in the preexistence we don’t know about because I believe it would affect us in an adverse way. I feel that we used to live with a good and gracious King who has sent us here to pass a loyalty test. We have the greatest learning experience we will ever have here. Testing us to see what is important to us so we can be judge by what we do. However it is easy to say Naaaaahhhh that ain’t right what a line of bull. Because I do not think that can happen, please show where you think I disagree with Clyde and agree with you. Clyde, Honestly it is not a matter of saying, Naaaaahhhh that ain’t right what a line of bull. It’s a matter of, their is zero evidence for it. Then add to that, this belief that people who sat on the side lines and did nothing were cursed with black skin poses a problem, and the people who lost are the fallen angels. The bible speaks about them and tells us what happened, and that story does not line up with what LDS believe. The Bible also tells us how and why Lucifer fell, and the BoM agrees with that story, and both of those stories, dont line up or agree with the story of the two different plans laid out by lucifer and Jesus for how to save mankind. So once you can prove what you believe from the Bible, or even history then we can really talk. Ecclesiastes 12:7 says our spirit will return God who made it. If we return to some place we must have been there before. Now I know you don’t see it that way but I do. I dont have a problem with that verse and it does not prove your view. God created us here on earth, in the garden, the Bible tells us that. The Bible also tells us, God is in Heaven and we have never been their. So we belong to God and after we die some will be with Him and many more will be in Hell as the Bible teaches. Read Job, Job was being rebuked by God and God said to Job, WHERE WERE YOU WHEN I CREATED THE HEAVENS AND DID THIS AND THAT. How can God say, where were you when I did this and that? When if we were with Him that either makes Him a liar, or we were not with Him. If you and parkman are correct and God reminds us of things we did prior to being here, then God should have said to Job, Dont you remember when I did this, or let me remind you of where you were and what I/we did. That simply is not the case. My link doesn’t seem to have worked in my last post, so here it is again. The stories of Satan’s fall in the Bible and Book of Mormon fit perfectly with the complete story of the preexistence and Lucifer presenting his plan. The problem is that they do not tell the complete story, but only part of it. Actually, in the Bible there is more of the story than you know, it is just broken up and pieces appear in various different places, and thus they need to be brought back together. On this count the problem is that you don’t see half of these pieces as belonging to this story. The preexistence is so clear in the Bible that I have always been baffled that people can’t see it. OF course they always have clever ways of explaining everything, and thus convince themselves it is not there. As such it is truly impossible to prove it to them, simply because they refuse to see it. Take Eccl. 12:7; you say you have no problem with it, and yet you fail to explain how we are going to return anywhere. We were in the Garden, but we will be with God, where we never were before. So how is this a return? It isn’t, and yet you have no problem with this, simply because you do not believe in the preexistence. Looking at Job you have reasoned yourself into not believing what is obviously taught. You insinuate that because God does not directly ask if he remembers these events than Job could not have been there. But what is God asking. He was asking if Job remembered. “Declare, if thou hast understanding.” It is obvious that Job was there, but that he lacked the memory, and thus the understanding to declare what he did at that time, or how it was done. When God was doing all this we were present, but in this life we lack the understanding to declare the methods and manners in which it was done. This only proves the veil exists. After, it was at this time that we do not remember that the “sons of God shouted for joy.” God is declared to be the “Father of spirits” (Hebrews 12: 9) as we are “His Offspring.” (Acts 17: 28) So, these sons that shouted for joy were us in our spirit form prior to earth life. We were there, but without memory we cannot declare these things of ourselves, for we lack understanding. It is God that must declare them to us, which he does, as he did here to Job. The Bible is so clear that there was a preexistence. How can anyone deny it. Yea, It’s about as clear as Mud, thats why only Mormons who twist scripture can see it. Maybe if you would clean the mud from your eyes it would be clearer to you as well. We are the only ones who see it because we have a clear vision, unlike others. Shem, their is no mud in my eye, I have been cleansed by the blood of the lamb. All their is, is a poisoned well that Mormons use and it will bring eternal death. It is only poisonous to those without faith, for if they partake they are hypocrites. The doctrine of the preexistence is all through the Bible, and anyone with a clear spiritual vision con see it. It it the true Gospel, revealed by Christ himself, sanctioned by him, and designed by him. It is the only religion that has the divine stamp of approval on it, and thus the only one with the power to lead men into salvation and eternal life. If your gospel is true as you claim, and JS is a true prophet of God as you claim, then why are all his prophecy’s failing? Why was the white horse prophecy a dismal failure, Why does the BoM teach their are the apostle John and 3 of his friends living till the return of Jesus walking the earth and sharing the gospel, yet no one ever hears of them or sees them? How come they dont come forward and speak to the world? Contrast this with the Book of Revelation and the two witness, it claims the whole world will see them and hear them. God wants His message spread, not hidden. Then Mormonism teaches their was a TOTAL APOSTASY, Yet if thats true, then John and his 3 friends cannot be alive, or is they are, then their was not a total apostasy since they are alive. There is no if about it. It is the true gospel, and when Christ returns all will see the truth of it. There is not a single prophecy that Joseph Smith ever made that has not been fulfilled to the letter; there is just those who don’t understand what they meant and so can’t see their fulfillment. As to John and the three Nephites, they were removed from the world for a time. Whether this means they were taken of the earth or not I couldn’t say. But the fact that the world became too wicked for their presence is stated clearly in the Book of Mormon (Mormon 8: 10). They have the authority to show themselves to whomsoever they choose (3 Nephi 28: 32) and so to say that because they are not revealing themselves to the world they don’t exist is ridiculous. I have no doubt that since the true gospel has been restored they have appeared to many. But I also have no doubt that such as have seen them are not generally want to boast about it. Those not of the true faith are not likely to see them at all. As to the apostasy, it is still and apostasy because, even though these men may have been on the earth, they were not allowed to use their priesthood, and thus that power was not had by mortal men (and these men were no longer mortal). What a joke, Lets see here, The Mormon Mitt was NOT ELECTED, So thats a false prophecy right their, Then The LDS or any off shoot group owns the land and built a temple in Missouri, so thats a false prophecy. Now you are being even more ridiculous. Just because something is not yet fulfilled does not make it a false prophecy. It only means it is not yet fulfilled, as can be attested to by the scores of prophecies in the Bible that have not yet been fulfilled but still will be. Now, I have no clue what you are talking about with Mitt Romney, but in all you say regarding this and Missouri, it seems clear that you are among those who don’t really understand what prophecy is, and thus have a false understanding of what Joseph Smith was actually prophesying about. In either case it doesn’t matter. Whether or not his prophecy is not yet fulfilled, but will be; or whether you just don’t understand what he was prophesying about; I have yet to read any prophecy given by Joseph Smith that was not fulfilled, which just proves he is a prophet. Shem, I understand that just because something has not come to pass yet does not make it true or false, But it is false when a time line is given and that time line passes by years and it still has not happened. We have … confidence in returning to Jackson county… There are many … still living, whose faith in returning to Jackson County, and the things that are coming, is as firm and fixed as the throne of the Almighty (Journal of Discourses, vol. 13, p. 138). … God promised in the year 1832 that we should, before the generation then living had passed away, return and build up the City of Zion in Jackson County…. We believe in these promises as much as we believe in any promise ever uttered by the mouth of Jehovah. The Latter-day Saints just as much expect to receive a fulfillment of that promise during the generation that was in existence in 1832 as they expect that the sun will rise and set to-morrow. Why? Because God cannot lie. He will fulfil all His promises. He has spoken, it must come to pass. This is our faith (vol. 13, p. 362). That Generation has come and gone, by many,many years, and the LDS dont even own the land and no temple is ready to be built or even be built in the next ten years. So yes it is false. Let me point out a few things about these quotes that you seem to have missed. First of all, in the first quote there is no timeline given. If you care to actually read the full context instead of splicing it you will see that the only thing that is being affirmed is that at a future time the Lord will restore the saints to their lands in Jackson County and that that will become the center of the church. This is perfectly true, and it was firmly believed by those who had lived at that time, and there was a hope that it would be in their life time. The second quote is not discussing prophecy but promise. The Lord promised that it would happen, but also put stipulations on that promise. So, while he hopes the promise would be fulfilled in the lifetime of that generation he still understands that such a fulfillment is dependent on those to whom the promise was made. It is just like ancient Israel. They were promised to be taken to a promised land. However, due to the wickedness of the people the Lord waited 40 years to fulfill that promise, allowing all the rebellious people to die.